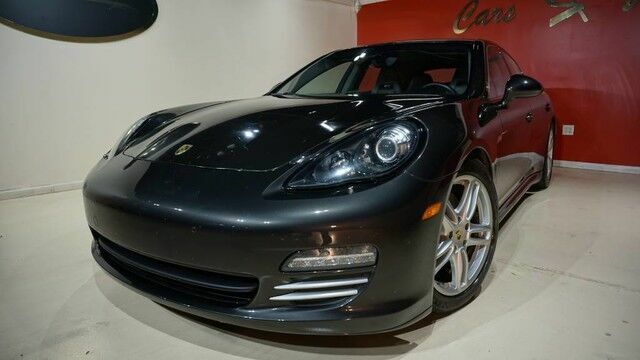 This outstanding example of a 2011 Porsche Panamera 4S is offered by Cars R Us LLC. Put performance, safety, beauty, sophistication and all the right amenities into a car, and here it is! Now you can own luxury without the luxury price tag! When the Porsche Panamera 4S was created, it was automatically enhanced by having the performance ability of all wheel drive. Not only will you notice improved steering and superior acceleration, but you can also rest easy knowing that your vehicle comes standard with increased stability and safety. In addition to being well-cared for, this Porsche Panamera has very low mileage making it a rare find. More information about the 2011 Porsche Panamera: Launched in 2010, the Panamera is Porsche's first 4-door 4-seat grand tourer. Its basic design is a complete departure from most of Porsche's rear and mid-engine sports car tradition, utilizing a front-mounted engine. The styling is unmistakably Porsche, with hints of 911 throughout but with an elongated shape that provides comfortable seating in the rear--even for passengers over 6 feet tall. It's perfect for those looking for the comfort and room of a BMW 7-series or Mercedes-Benz S-Class, while wanting the performance and handling that is Porsche's trademark. This model sets itself apart with Unmistakable styling, Porsche-standard performance and luxury, seating for four in well-appointed interior.